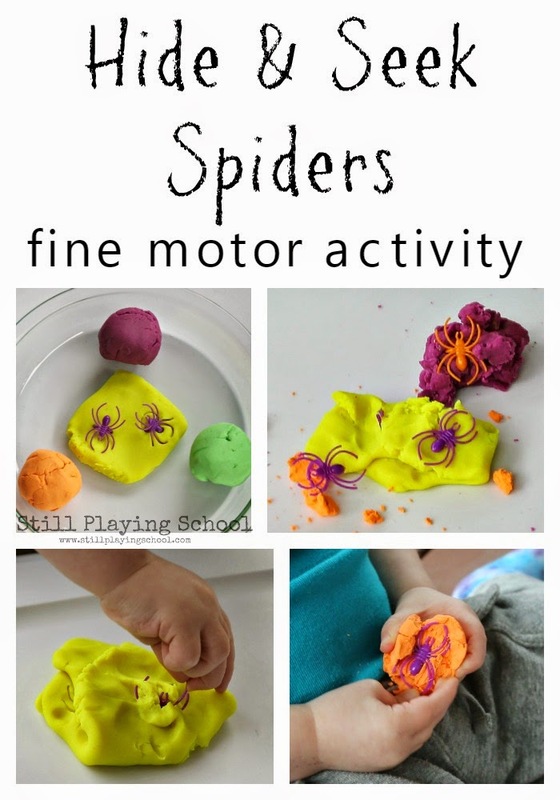 Hide and find spiders in this play dough activity for preschoolers and toddlers! Kids will love digging out and re-hiding the creepy crawlies in the sensory dough for Halloween. 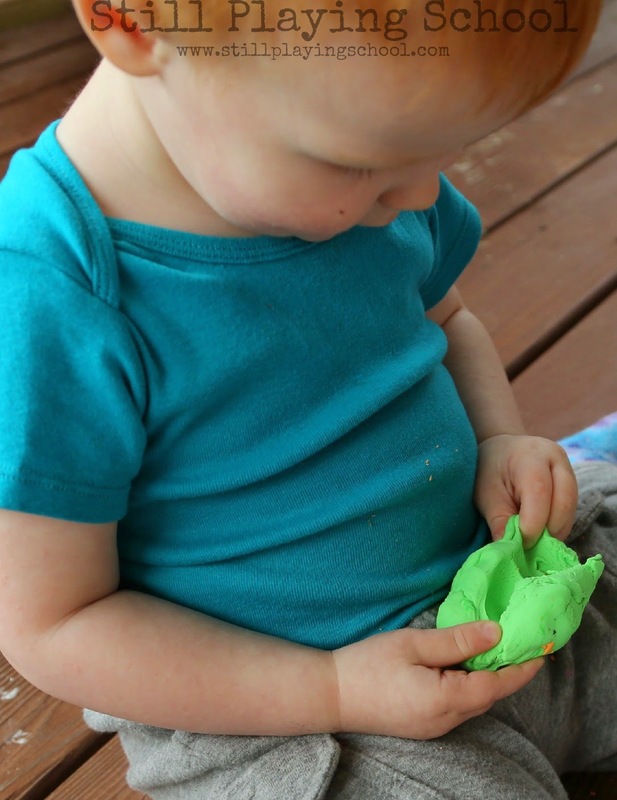 This Fine Motor Fridays post is inspired by an activity I did with E when she was D's age! 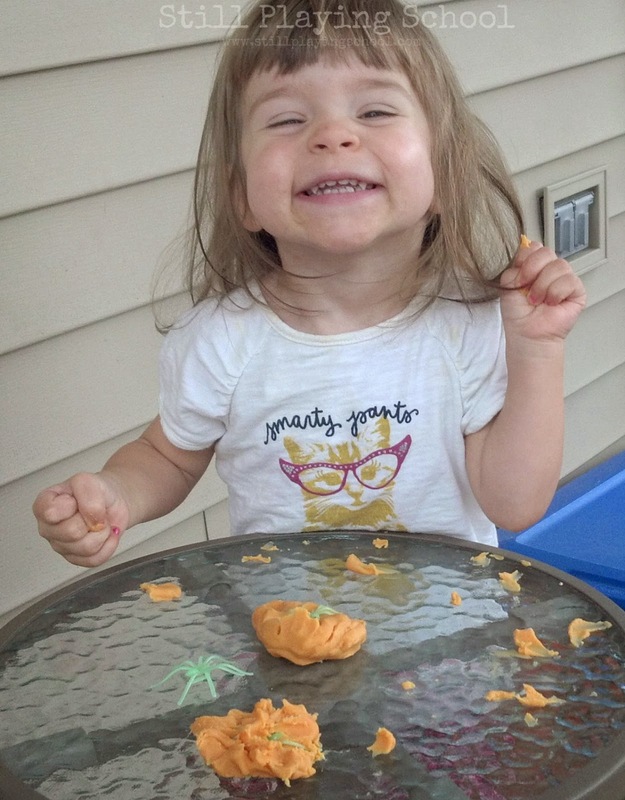 I wasn't up to doing many activities with her during while pregnant with Violet but this one was simple, quick, seasonal, and encouraged fine motor practice! 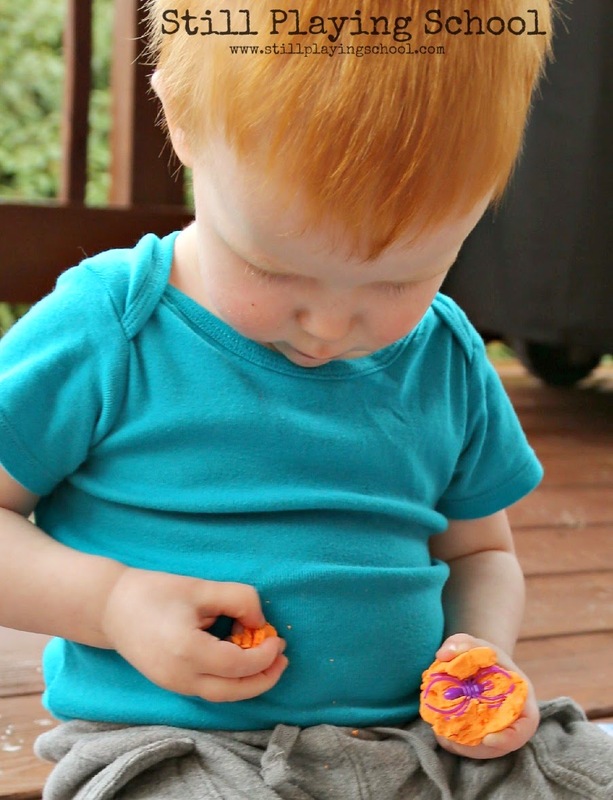 We love to make our own sensory recipes, but for this activity we used store bought Play Doh! Some was a bit crumbly and old while some was the super smooth play dough so each required different fine motor work. Yikes, you know what? 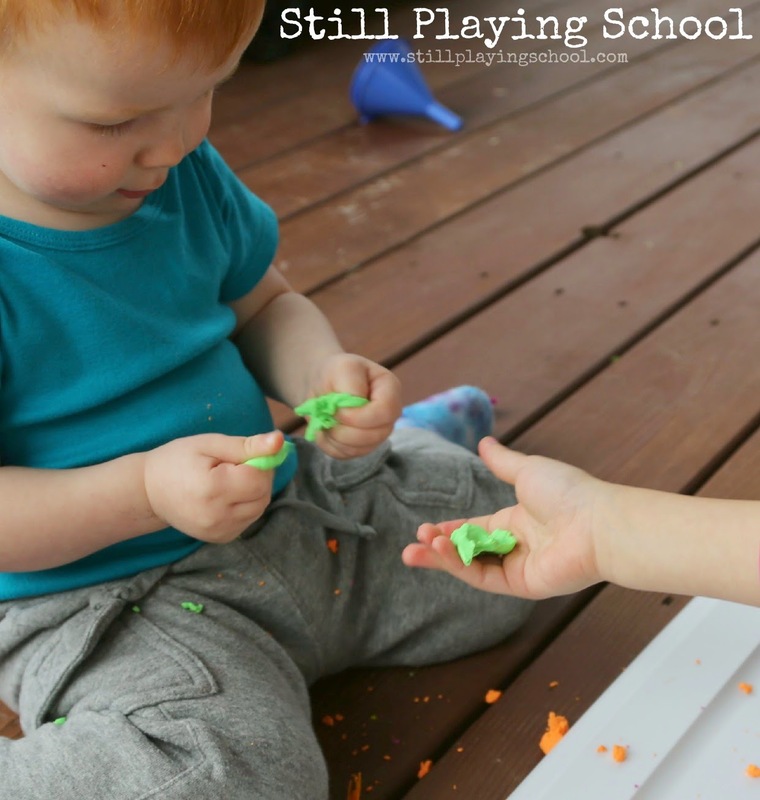 The crumbly orange might be the same play dough E was using three years ago! I stuck plastic spider rings straight in a bit of play dough. I hid spiders inside a few balls of play dough. Yes, these are the same spiders we used for our Glowing Spider Webs! Toddler D was concentrating so hard you could hear him breathing! Our preschooler E loved working out dig out those hidden spiders too. They pressed the spiders into the dough to check out the imprints they made. Look at that varied fine motor action! I love watching both kids play simultaneously together. They were working together cooperatively quite a bit. D would pass E pieces of play dough that he pulled off. E would re-hide the spiders and roll the balls up again. She handed them back to D asking him to, "Guess what color spider is inside this one!" She is helping him learn color names. 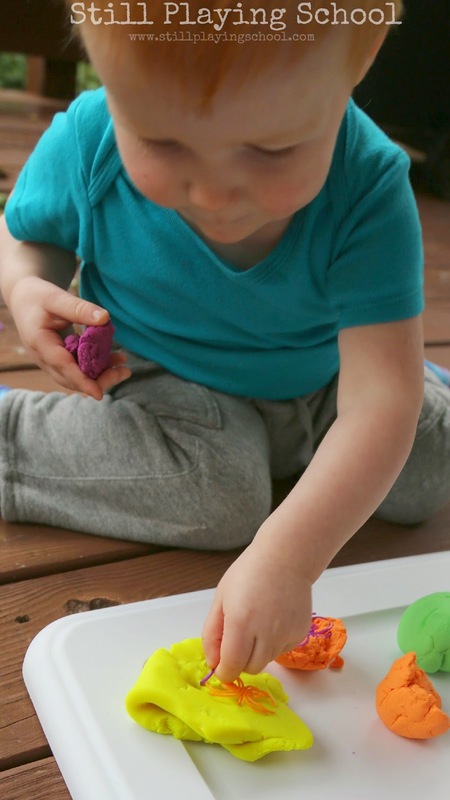 Since this play dough was crumbly and our toddler was excitedly tossing pieces aside as he worked we played outside on a tray. Clean up was super easy and E even helped! This green play dough is the Play-Doh Plus version. 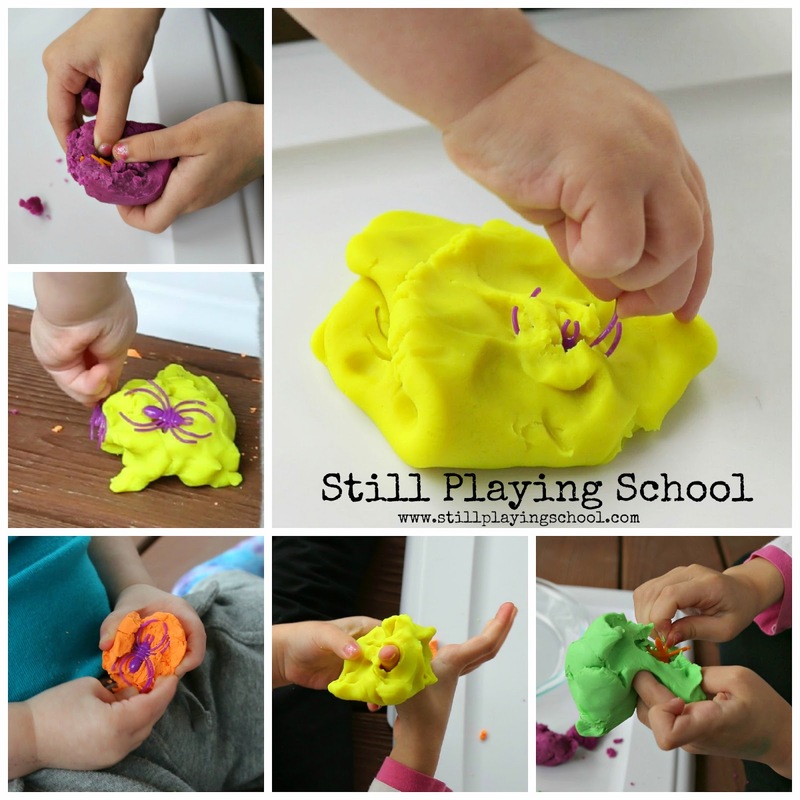 It is so silky smooth and a totally different texture than traditional Play-Doh. 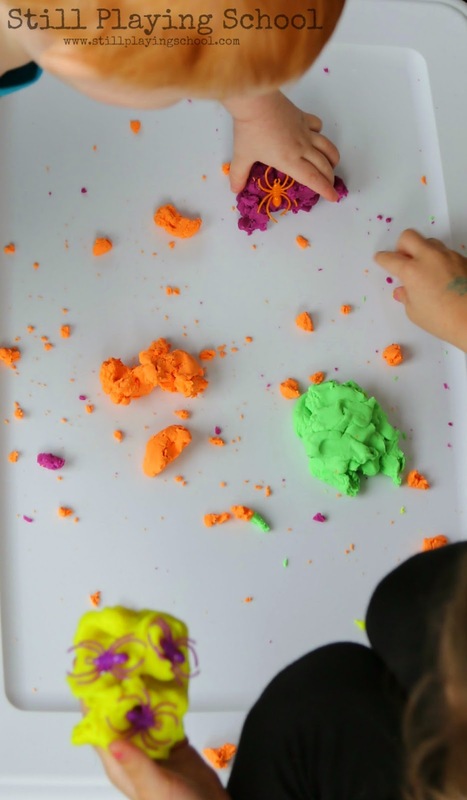 You could use this activity at a restaurant table while you waited for food to arrive (just make sure the play dough you pack isn't crumbly) or in a busy bag for quiet time! I know, seems crazy, right? But we do usually make and use our own recipes! 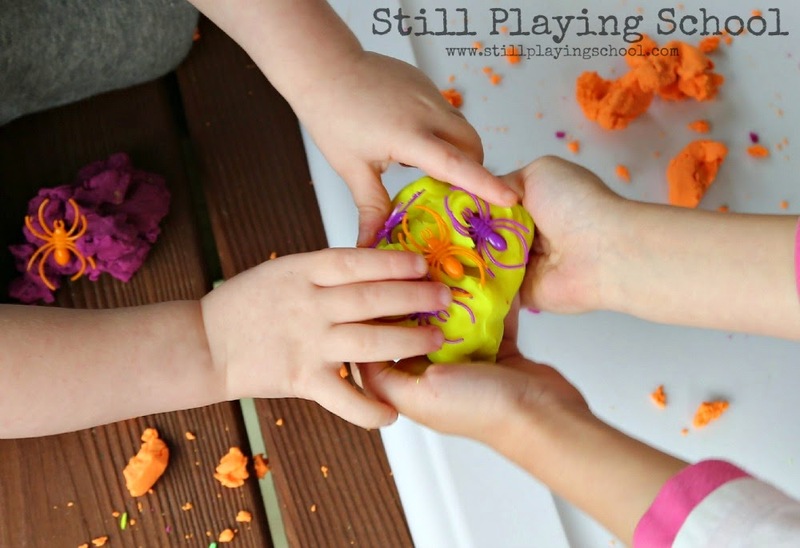 How can you keep playdough for three years ? This looks fun I'm still amazed at how old your playdough is.